Below I have posted a brief summary and review of a short book I recently read as I was reviewing literature that teaches the Psalms. I found this book helpful as a quick and basic summary of much of the current scholarship on the book of Psalms. Not only does this book hit the highlights of Psalms scholarship but focuses on the preaching of the Psalms. If you are a preacher of the word or just a lay person that wants to know more about the Psalms I highly recommend this book. Here is my brief summary and review. I hope you find it helpful. 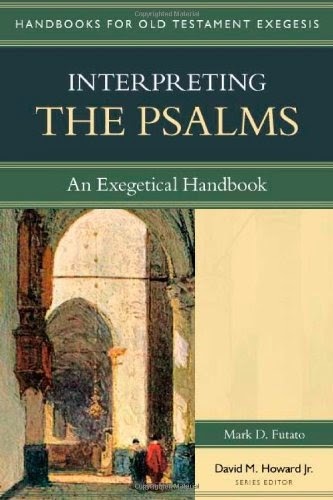 Interpreting The Psalms is one of six books in Kregel’s series Handbooks For Old Testament Exegesis (HOTE). The series is aimed at the graduate student but is not out of bounds for the “well-motivated” lay person (14). The series has two stated purposes: 1) to help the reader understand the different literary genres of the Old Testament, 2) and to “provide strategies…for preaching and teaching these genres” (13). Currently the series includes volumes on “narrative, law, poetry, wisdom, prophecy, and apocalyptic” Old Testament literature. The series is edited by David M. Howard Jr. who teaches Old Testament at Bethel Seminary and serves as the dean of the Center for Biblical and Theological Foundations (back cover). The author of the current volume, Mark Futato, is the Robert L. Maclellan professor of Old Testament at Reformed Theological Seminary (back cover). Both the author and series editor are well known authorities in Psalms scholarship. Every volume in the HOTE series includes a “six-chapter structure” moving from understanding a particular Old Testament literary genre to preaching from that genre (14). In the following pages the content of each chapter will be briefly considered along with brief evaluation of the strengths and weaknesses of the book. Chapter one considers the nature of Old Testament poetry and particularly the poetry of the Psalms. Futato defines Hebrew poetry as, “…a type of literature that communicates with terse lines employing parallelism and imagery in high frequency” (24). Futato then goes on to explain and show aspects of parallelism and imagery that occur in Hebrew poetry. Before explaining these key aspects of Hebrew poetry, Futato gives a great introduction to the parts and pieces of Hebrew poetry including: the line, colon (and variations on), strophe, stanza, as well as aspects of inclusion. Futato rounds out the chapter discussing different patterns of poetic organization. Throughout Futato explains the current developments in the study of Hebrew poetry as well as historical thought. I found this chapter to be a great quick summary of the basic pieces of Hebrew poetry as well as an easy reference tool. The book also includes a glossary of all the terms discussed throughout that is very helpful. In chapter two Futato takes a look at the Psalms as a complete book. This is the largest chapter in the book and probably the most important. Here Futato discusses what he understands to be the Psalms overarching purpose as “an instruction manual or ‘guidebook along the path of blessing’” (60). Futato further expands this purpose to include two focal points: 1) “instruction for happiness,” 2) and “instruction for holiness” (63). After working through the purpose of the Psalms, Futato then turns to the over-arching message of the Psalms. Where the purpose comes from Psalm 1, the message can be seen in Psalm 2 (72). The dominant theme of the book of Psalms for Futato is “the kingship of God” (72). He examines this theme by working through what it means that “God is King,” how “our destiny is glory,” and “the eschatological hope that our King is coming” (72). Futato’s approach to the five books of the Psalms is in line with the growing consensus of canonical scholarship on the book of Psalms. Books 1-3 follow the Davidic monarchy as it rises and falls (81). Books 4-5 provide an answer “to the apparent failure of the” Davidic covenant with faith in God’s eternal reign and hope in the coming Messianic King (81, 86). Futato completes chapter two by considering several other themes including: the Lord as refuge (96), and “blessing for the nations” (104). Like chapter one this chapter is a great summary of current scholarship and thought on the purpose and message of the Psalter as a book. I highly recommend this chapter to anyone that wants to easily understand the over-arching message of the Psalms. Chapters three and four are similar to chapter one in that they give more technical information to understand Hebrew poetry. Chapter three considers the historical setting of the individual psalms as well as aspects of textual criticism. This chapter also includes a good bibliography for further study of the Psalms and should be consulted. Chapter four considers the different contexts that can affect interpretation of the Psalms including: historical, cultural, theological, and the categorical context (144-145). Futato then discusses in depth the categories of hymn, lament, thanksgiving, confidence, divine kingship, wisdom, and the way each speaks about Christ. My biggest critique of this book comes out of chapter four. I know the aim of the HOTE series is to give “students basic skills for exegeting and proclaiming…different genres of the Old Testament” (13), but I don’t think the shift in terminology Futato has made in this chapter from the traditional term “form” to “category” is helpful. All of Futato’s categories are basically, with some variation, the forms that came out of form criticism. I think the aspiring Old Testament student would be better served if the traditional term of “form” was introduced with a small mention of its history. Despite this change in terms, Futato’s discussion of the categories is very good. In chapters five and six a turn is made toward preaching. In chapter five Futato explains the process of producing a sermon from a study of the Psalms including the use of everything previously mentioned in the book. Much of the information in this chapter will be familiar to anyone who preaches exegetical sermons regularly, but the chapter is a very good guide for anyone that wants to grow in their preaching ability, or just needs a good reminder. I particularly enjoyed Futato’s discussion on the differences between analytical and topical approaches to outlining and preaching Psalms as well as his suggestions for the design of possible sermon series in the Psalms. Chapter six is a full-scale example of everything Futato has been advocating in his book. He puts all the pieces together and walks through the thought processes of exegesis and sermon preparation. Interpreting The Psalms is a great introduction to Hebrew poetry and the book of Psalms. Futato covers all the important aspects of current scholarship as well as giving pertinent background information. I appreciate that the HOTE series keeps the preaching of a text in view and helps the reader get from text to sermon. I highly recommend this book to anyone who wants to better understand the book of Psalms as well as to any preacher that needs help in thinking about how to preach the Psalms. I look forward to reading other books in this series. *This brief book summary and review was originally written for the partial fulfillment of a PhD at Golden Gate Baptist Theological Seminary. No part of this review should be used without proper citation.